A description of how to run the TCP/IP protocol with Windows for Workgroups. 11nThe information provided here is an exert from Appendix E of the Windows for Workgroups Resource Kit. To purchase the Windows for Workgroups Resource Kit call Microsoft Sales at 800-426-9400. This appendix contains information that describes the procedures for installing and configuring the Microsoft TCP/IP, Microsoft ASYBEUI, Microsoft DLC, and AT&T StarLAN ISO protocols for use with Windows for Workgroups. A solid understanding of the network protocols that are described in this appendix is helpful, and will help to ensure a successful installation. NoteThe information provided in this appendix is preliminary and was not completely tested by Microsoft at the time the Windows for Workgroups Resource Kit went to print (September 1992). 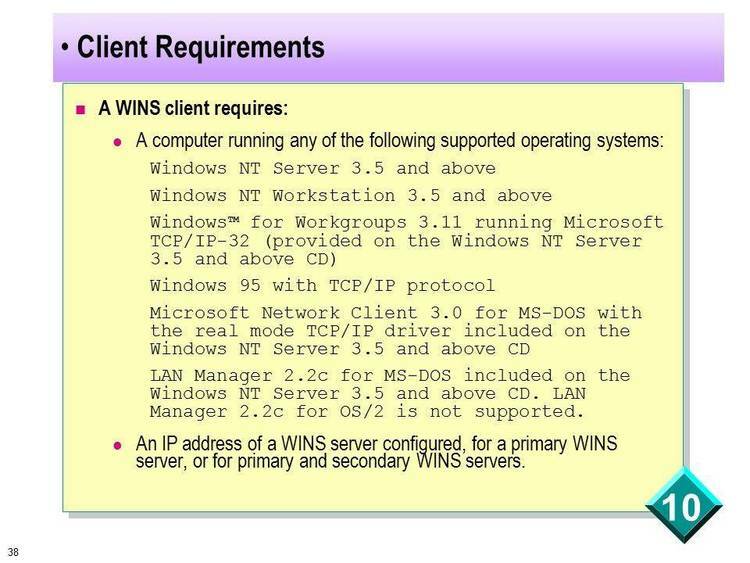 Windows for Workgroups fully supports connectivity to LAN Manager and Novell NetWare networks using NetBEUI and MSIPX protocols, respectively, as described in Chapter 8, Network Integration with Microsoft LAN Manager and Novell NetWare. Other protocols and networks may work with Windows for Workgroups, however, limited support may be available for these from Microsoft Product Support Services (PSS). Related informationWindows for Workgroups Resource Kit. Chapter 6, Windows for Workgroups Initialization Files; Chapter 7, Additional Windows for Workgroups Information;Chapter 14, Troubleshooting Windows for Workgroups. Microsoft LAN Manager 2.1 provides support for several protocols not provided as part of Windows for Workgroups. These additional protocols include TCP/IP, ASYBEUI (used for remote asynchronous connectivity; also known as Remote Access Services or RAS), and DLC. In general, any NDIS-compliant protocol can work with Windows for Workgroups. The issue is whether the protocol has been integrated with a SETUP installation procedure, or whether the settings files (for example, CONFIG.SYS, AUTOEXEC.BAT, and PROTOCOL.INI) must be hand-edited to configure the protocol. The protocol installer for use with LAN Manager was not revised before Windows for Workgroups was made available, but the procedures below describe how the settings files can be modified to use other protocols. The protocols provided by Microsoft for use with LAN Manager will be modified to install on a Windows for Workgroups workstation, but they were not available at the time the Windows for Workgroups Resource Kit manual was released to print (September 1992). The following information was compiled during the beta test for Windows for Workgroups and will aid you in getting these additional transport protocols to work with Windows for Workgroups. Installation of the TCP/IP protocol stack requires the manipulation of the CONFIG.SYS, AUTOEXEC.BAT, PROTOCOL.INI, and SYSTEM.INI files on Windows for Workgroups computers. The following steps have been prepared to make the task easier. A completed example of each of these files has been provided at the end of this section for reference. NoteThe following steps discuss the installation of the basic TCP/IP protocol stack. These procedures do not discuss the installation of the TCP/IP Utility pack. Thus, this installation won't permit the use of the sockets library. 1.Install MS-DOS LAN Manager on a computer. Before installing TCP/IP, you must first get a copy of the files. This is easily done by installing MS-DOS LAN Manager on a single computer, and then copying the files on a floppy disk or a file share point for distribution to Windows for Workgroups computers. NotePlease follow the procedures and installation prompts for installing the TCP/IP protocol stack. When prompted for the IP address, sub-net mask, and the default gateway address, you may want to use information for one of the workstations you will be installing. You will be adding this information manually to the PROTOCOL.INI file during the actual installation. 3.Install Windows for Workgroups on a computer. NoteThe directories for the device drivers and the information pointer for the TCPUTILS.INI file (/i:c:\windows) may be different if Windows for Workgroups was installed in a directory other than that referenced in these procedures. Refer to the directory discussion in step 4. 6.Make the follow modifications to the AUTOEXEC.BAT file. NoteThe LANA number may be different if other protocols are being loaded before the TCP/IP stack. Also, the device driver identifier (shown as MS$ELNKII in these steps) is dependent on the type of network interface card you are using. The lanabase= value must match the lanax= entry in the [network. setup] section. The bindings= entry is the section name ( [xxxxxx] ) of the device driver to which the TCP/IP stack will be bound. This value is dependent on the type of network interface card used. The ipaddress0, subnetmask0, and defaultgateway0 values are computer- and site-dependent. These values are provided as an example. Of special interest is that spaces are used as separators in the numbers instead of the more traditional periods. Notice the nbsessions value was increased from its LAN Manager default value of 6, to increase the number of sessions supported by the TCP/IP device driver. NoteThe parameter for V86ModeLanas= is a list of LANA numbers that are supported by real mode protocol stacks. If TCP/IP has been given a different LANA number it should be used. Increase the netheapsize= parameter in the [386Enh] section from its default value of 20 to 60. NoteThe additional memory is needed as buffer space for passing network frames between real and protected mode. Once all steps are completed and verified, restart the computer to load the needed device drivers, and TSRs. Figure E.1 details the active components of the TCP/IP installation. Notice that NMTSR.EXE is an optional component and is used only with the PING utility. The following are the final installation images of CONFIG.SYS, AUTOEXEC.BAT, and PROTOCOL.INI. Areas where you need to make changes manually (per the preceding procedure) are highlighted in bold. WORKGRP.SYS will give a diagnostic error at startup (No NETBEUI section found in configuration information) if you do not have NetBEUI as an additional protocol. This is expected and harmless. TCP/IP may require time to identify itself on the LAN/WAN before starting Windows for Workgroups. Therefore, if you start Windows for Workgroups automatically from AUTOEXEC.BAT, it is recommended that you place a PAUSE statement before you invoke Windows for Workgroups and allow approximately 10 seconds for the TCP/IP protocol to initialize before proceeding.